Joe Diffie performing in 2007. Joe Logan Diffie (born December 28, 1958) is an American country music singer. After working as a demo singer in the 1980s, he signed with Epic Records' Nashville division in 1990. Between then and 2004, Diffie charted 35 cuts on the Billboard Hot Country Songs chart, including five number one singles: his debut release "Home", "If the Devil Danced (In Empty Pockets)", "Third Rock from the Sun", "Pickup Man" (his longest-lasting number one, at four weeks) and "Bigger Than the Beatles". In addition to these cuts, he has 12 other top ten singles and ten other top 40 hits on the same chart. He also co-wrote singles for Holly Dunn, Tim McGraw, and Jo Dee Messina, and has recorded with Mary Chapin Carpenter, George Jones, and Marty Stuart. Diffie released seven studio albums, a Christmas album and a greatest hits package under the Epic label. He also released one studio album each through Monument Records, Broken Bow Records, and Rounder Records. Among his albums, 1993's Honky Tonk Attitude and 1994's Third Rock from the Sun are certified platinum by the Recording Industry Association of America; 1992's Regular Joe and 1996's Life's So Funny are both certified gold. His most recent album, Homecoming: The Bluegrass Album, was released in late 2010 through Rounder. His style is defined by a neotraditionalist country influence with a mix of novelty songs and ballads. 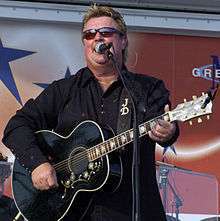 Joe Diffie was born into a musical family in Tulsa, Oklahoma, in 1958. His first musical performance came at age four, when he performed in his aunt's country music band. Diffie's father, Joe R., played guitar and banjo, and his mother sang. Following in his mother's footsteps, Diffie began to sing at an early age, often listening to the albums in his father's record collection. Diffie has said that his "Mom and Dad claimed that [he] could sing harmony when [he] was three years old." His family moved to San Antonio, Texas while he was in the first grade, and subsequently to Washington state where he attended fourth and fifth grades. Later, he moved to Wisconsin for the years he was in sixth grade through his second year of high school, and back to Oklahoma where he attended high school in the town of Velma. In his last two years in high school, Diffie played football, baseball, and golf in addition to running track; in his senior year he was recognized as Best All-Around Male Athlete. After graduating, he attended Cameron University in Lawton, Oklahoma. Although he initially earned credits toward medical school, he decided against a medical profession after marrying for the first time in 1977, and ultimately dropped out before graduation. Diffie first worked in oil fields, then drove a truck that pumped cement out of oil wells in Alice, Texas, before he moved back to Duncan to work in a foundry. During this period, he worked as a musician on the side, first in a gospel group called Higher Purpose, and then in a bluegrass band called Special Edition. Diffie then built a recording studio, began touring with Special Edition in adjacent states, and sent demo recordings to publishers in Nashville. Hank Thompson recorded Diffie's "Love on the Rocks", and Randy Travis put one of Diffie's songs on hold but ultimately did not record it. After the foundry closed in 1986, Diffie declared bankruptcy and sold the studio out of financial necessity. He also divorced his wife, who left with their two children. Diffie spent several months in a state of depression before deciding to move to Nashville, Tennessee. There, he took a job at Gibson Guitar Corporation. While at Gibson, he contacted a songwriter and recorded more demos, including songs that would later be recorded by Ricky Van Shelton, Billy Dean, Alabama, and The Forester Sisters. By mid-1989, he quit working at the company in order to record demos full-time. Diffie also met Debbie, who would later become his second wife. That same year, Diffie was contacted by Bob Montgomery, a songwriter and record producer known for working with Buddy Holly. Montgomery, who was then the vice president of A&R at Epic Records, said that he wanted to sign Diffie to a contract with the label, but had to put the singer on hold for a year. In the meantime, Holly Dunn released "There Goes My Heart Again", which Diffie co-wrote and sang the backing vocals. Following this song's chart success, Diffie signed with Epic in early 1990. The label released Diffie's debut album, A Thousand Winding Roads, at the end of 1990, with Montgomery and Johnny Slate as producers. Its first single, "Home", reached the top of the Billboard Hot Country Songs charts. The song was also rated number one on the country music charts published by Radio & Records and Gavin Report, making him the first country music artist to have a number one debut single on all three charts, as well as the first country music artist to have a debut single spend more than one week in the number one position at the latter two publications. Diffie co-wrote the album's second and fourth releases, "If You Want Me To" and "New Way (To Light Up an Old Flame)"; both peaked at number two on Billboard, and the former reached number one on the RPM country music charts in Canada. Between these two songs, "If the Devil Danced (In Empty Pockets)" became Diffie's second Billboard number one. The album itself peaked at number 23 on Top Country Albums. Diffie also performed his first concerts in late 1990, touring with George Strait and Steve Wariner. In that same year, Cash Box magazine named him Male Vocalist of the year. In 1991, Diffie co-wrote the tracks "Livin' on What's Left of Your Love" and "Memory Lane" on labelmate Keith Palmer's debut album. Diffie's second album, titled Regular Joe, was released in 1992 and was certified gold by the Recording Industry Association of America. The first two singles from the album both peaked at number five on Billboard: "Is It Cold in Here" and "Ships That Don't Come In", with the latter reaching number one on Radio & Records. The album's third single, "Next Thing Smokin'", made its chart debut one month before "Not Too Much to Ask", a duet that Diffie recorded with Mary Chapin Carpenter for her album Come On Come On. Both of these songs made the country Top 20, respectively reaching sixteen and fifteen, and the duet was nominated for a Grammy Award for Best Country Collaboration with Vocals at the 35th Grammy Awards in 1993. The final single from Regular Joe was "Startin' Over Blues" (originally the B-side to "Ships That Don't Come In"), which peaked at number 41. Also included on the album was the ballad "Goodnight Sweetheart", later a Top 10 country hit in 1996 for David Kersh. Brian Mansfield gave the album a positive review in Allmusic, saying that it "has all the clichés of country music, and all the good stuff too." Richmond Times-Dispatch reviewer Norman Rowe referred to Diffie as a "pleasant surprise" and called "Is It Cold in Here" "the sort of tear-jerker George Jones has worked wonders with in the past". Alanna Nash of Entertainment Weekly thought that Diffie "[sang] in his natural voice", but thought that its material "punches all the predictable thematic buttons." 1993's Honky Tonk Attitude shipped a million copies in the United States and was certified platinum. The first three singles from the album all reached the Top Ten on the country singles charts: the title track (which Diffie co-wrote) and the Dennis Linde composition "John Deere Green" both peaked at number five, with the number three "Prop Me Up Beside the Jukebox (If I Die)" in between. "John Deere Green" also accounted for Diffie's first appearance on the Billboard Hot 100, where it peaked at number 69. "In My Own Backyard", the last release from Honky Tonk Attitude, reached number nineteen on the country charts. Diffie told the Fort Worth Star-Telegram that the album was "a little rowdier than the first two." Nash rated the album more favorably than the ones before it, saying that Diffie "is maturing into a first-rate interpreter of working-class woes." Also in 1993, Diffie was inducted into the Grand Ole Opry. He and several other artists won that year's Country Music Association award for Vocal Event of the Year, for their guest vocals on George Jones's "I Don't Need Your Rockin' Chair". Tim McGraw also included two of Diffie's songs on his 1993 debut album: another version of "Memory Lane", which he released as a single, and "Tears in the Rain". Third Rock from the Sun was Diffie's highest-charting Top Country Album (where it reached number six), as well as his second consecutive platinum album. It was also the first album that he co-produced, doing so with Johnny Slate. The album included two consecutive number one singles in its title track and in "Pickup Man". The latter of those two songs was Diffie's longest-lasting number one, at four weeks. Both songs also entered the Hot 100, respectively peaking at 84 and 60. In 2005, "Pickup Man" was repurposed by the Applebee's restaurant chain for use in its television commercials. The album's next single, "So Help Me Girl", peaked at number two on the country charts and 84 on the pop charts, in addition to topping the RPM country charts. The song was covered in 1997 by English singer Gary Barlow. Diffie followed the song with "I'm in Love with a Capital 'U'" and "That Road Not Taken", which respectively reached country peaks of 21 and 40. Third Rock from the Sun received critical praise for adding more rock and up-tempo material. Thom Owens wrote that he began "adding more rock flourishes" on this album, and Nash said that Diffie "not only understands the blue-collar ethic from the inside out – he's also familiar with its humorous underbelly." In mid-1995, he recorded the title track for Columbia Records's Runnin' Wide Open, an album comprising NASCAR-themed songs by various artists. He issued two albums later in the year. The first was a Christmas project titled Mr. Christmas, which comprised covers of traditional Christmas songs as well as newly written songs. One of these original songs, "LeRoy the Redneck Reindeer", was issued as a Christmas single late in the year, peaking at number 33 upon its initial release and re-entering the country music charts for the next two years based on Christmas airplay. Of this album, Stephen Thomas Erlewine said, "it's pleasant, but it's not particularly distinguished." His other release that year was the studio album Life's So Funny. It was led off by "Bigger Than the Beatles", the last number one single of his career. The album's other two singles were "C – O – U – N – T – R – Y" and "Whole Lotta Gone" (previously the b-side of "Bigger Than the Beatles"), both of which peaked at 23 on the country music charts in 1996. Country Standard Time critic George Hauenstein praised the album for containing "songs that are slightly different from [what] those other artists sing." Owens thought that it was a "varied collection of ballads and midtempo rockers", but said that it was not "as consistently engaging" as Third Rock from the Sun. Nash gave "Bigger Than the Beatles" a C-minus rating, calling it "just a lame device to evoke the names of beloved rock heroes." Twice Upon a Time followed in 1996. Its singles all failed to make the Top Ten on the country charts, with lead-off "This Is Your Brain" reaching number 25, followed by "Somethin' Like This" at number 40 and "The Promised Land" at number 61, the lowest-peaking single of his career. The album also failed to achieve a gold certification. Doug Virden and Drew Womack, who then recorded on Epic in the band Sons of the Desert, sang backing vocals on it. Also included on the album was "I Got a Feelin'", which Tracy Lawrence previously recorded on his 1994 album I See It Now. Jeffrey B. Remz criticized the two novelty songs on Twice Upon a Time for lacking substance, and thought that most of the ballads were well-sung, but that the production "lacks any soul." Owens said that it "doesn't offer anything new or especially remarkable from Joe Diffie." In mid-1998, Epic Records released Diffie's Greatest Hits package, which featured three new cuts. Among these were "Texas Size Heartache", and its b-side, "Poor Me", which respectively reached numbers four and forty-three on the country charts. At the end of the year, Diffie recorded a cover of Charlie Rich's "Behind Closed Doors" for the multi-artist album A Tribute to Tradition on Columbia Records. Diffie's version of the song peaked at number 64 based on unsolicited airplay. He also contributed to another cut on that album, "Same Old Train", which featured Marty Stuart and eleven other country music singers. This song peaked at 59 on the country charts and won the 1999 Grammy Award for Best Country Collaboration with Vocals for all artists involved. His final album for Epic Records, titled A Night to Remember, was released in 1999. As he did with the new cuts for his Greatest Hits package, Diffie worked with producer Don Cook and producer/session drummer Lonnie Wilson, a friend of Diffie's who formerly fronted the band Bandana. Its title track spent twenty-nine weeks on the country charts and peaked at number six; it was his only Top 40 on the Hot 100, where it reached number 38. After this song came "The Quittin' Kind" and "It's Always Somethin' ", which respectively reached twenty-one and five on the country charts, and 90 and 57 on the Hot 100. The latter spent thirty-seven weeks on the country music charts, the longest chart run achieved by any of his singles. Country Standard Time gave the album a positive review for having "nary a novelty tune in the bunch", and Nash wrote that it had a "surprising depth of feeling." Erlewine also noted that the album did not contain any novelty songs, and called it the "purest country album he's ever made." In 2001, Sony Nashville transferred Diffie from its Epic division to the Monument Records division. This move was due to a corporate decision that Epic had too many artists and Monument had too few. Cook and Wilson also produced his only album for Monument, which was titled In Another World. Regarding this album, Diffie told Billboard that its material had a common theme of love, and that he wanted to create a more contemporary sound through the production. The album's title track peaked at number ten on the country charts and number 66 on the Hot 100. Only one other single was released from the album: "This Pretender" (co-written by Rascal Flatts lead singer Gary LeVox), which failed to make the country music Top 40. In Another World received mixed reviews. Country Weekly reviewer wrote that Diffie "deals with adult emotions" and described the title track as "a shimmering ballad perfect for his expressive tenor." William Ruhlmann called the album "sturdy formula country", and Jeffrey B. Remz of Country Standard Time said that he "easily interpret[s]" the songs but "doesn't seem to be doing anything too dramatically different." After Monument closed its Nashville branch, Diffie began touring with Mark Chesnutt and Tracy Lawrence on the Rockin' Roadhouse Tour, which began in 2002. That same year, Diffie was inducted into the Oklahoma Music Hall of Fame. Diffie signed to the independent Broken Bow Records in 2003. His only album for the label was Tougher Than Nails, which he and Wilson produced with Buddy Cannon. It included five songs that Diffie co-wrote, as well as a duet with George Jones entitled "What Would Waylon Do". Tougher Than Nails produced a Top 20 hit in its title track, followed by "If I Could Only Bring You Back", which peaked at number 50 and spent only eight weeks on the charts. This latter song was also his last charting single. Erlewine said of the album's content, "there's nothing new, but there doesn't need to be", and Country Standard Time said that the album "shows that he's still got the talent that took him to stardom in the first place." In 2005, Jo Dee Messina released "My Give a Damn's Busted", which Diffie co-wrote and originally recorded on In Another World. Her version of the song, included on her album Delicious Surprise, was a number one single that year. After leaving Broken Bow, Diffie continued to tour, primarily playing smaller venues and county fairs. In 2007, he joined with Lonestar, Charlie Daniels and Craig Morgan to perform a benefit concert for Sgt. Kevin Downs, a soldier who was severely wounded in Iraq. In 2008, Diffie compiled and released a live album, and he signed to Rounder Records later in that year. Rounder released an album called The Ultimate Collection, which comprised re-recordings of his hits for Epic. His next project for Rounder, Homecoming: The Bluegrass Album, was released on October 26, 2010. It includes collaborations with The Grascals, Rhonda Vincent and other bluegrass artists. Diffie toured at various county fairs in August 2010 in support of it. He co-produced the album with Luke Wooten, and included on it the song "Tennessee Tea", which Diffie originally recorded while he was in Special Edition. Allmusic reviewer j. poet gave this album a positive review for showing Diffie's bluegrass influences. In late 2012, Jason Aldean recorded the song "1994", co-written by Thomas Rhett, Luke Laird, and Barry Dean. The song, which was released in February 2013 as the third single from Aldean's album Night Train, name-drops Diffie and incorporates several of his song titles into the lyrics. Upon hearing about the song, Diffie said that "it's really an honor" to be mentioned in the song, and that it was "flattering". Later in the year, Diffie collaborated with Aaron Tippin and Sammy Kershaw on the album All in the Same Boat as well as cutting the single "Girl Riding Shotgun" with D Thrash of the Jawga Boyz. Steve Huey of Allmusic wrote that Diffie "lent his traditional sensibilities to humorous, rock-tinged novelties and plaintive ballads." His early albums for Epic mostly consisted of ballads, but starting with Honky Tonk Attitude, he began to include more up-tempo and novelty numbers. Starting with A Night to Remember, Diffie returned to a more ballad-oriented sound; Mike Kraski, then the senior vice president of sales for Sony Music Nashville, thought that the albums before it had over-emphasized his novelty releases. Alanna Nash regularly compared Diffie's voice to that of George Jones. In her review of A Thousand Winding Roads, she contrasted the album with Mark Chesnutt's debut Too Cold at Home by saying, "While Chesnutt merely takes his inspiration from Jones, Diffie mimics Jones' delivery ... But now that he's making records himself, [his vocal imitation] drops him to the rear of the pack, as a stylist with little style of his own." She thought that Diffie began to move away from his George Jones influences on A Night to Remember. William Ruhlmann wrote that Diffie "has put together a decade-plus career in country largely on his ability to succeed" in "scour[ing] Nashville publishers for ten good compositions in the established style", and that he was an "adequate but undistinguished singer." Diffie has been married three times. His first wife was Janise Parker, whom he married while in college. The couple had two children, Parker and Kara, then divorced in 1986. Parker later worked as Diffie's on-road manager in the mid-2000s, and in mid-2010, he and Kara auditioned for American Idol. Two years after divorcing Janise, Diffie married Debbie Jones, a nurse technician. They had two sons, Drew and Tyler, the latter of whom was born with Down syndrome and nearly died in 1991 following complications from a tonsillectomy. Diffie began an affair with Liz Allison, the widow of NASCAR driver Davey Allison, in 1993. In 1994, a judge ordered Diffie to pay Jones $3,000 per month towards their pending divorce settlement, and not to allow Drew and Tyler to be in the presence of any girlfriend; he divorced Jones in 1996. In 2000, Diffie married the former Theresa Crump, whom he met at a concert, at the Opryland Hotel in Nashville, Tennessee. They have one daughter, Kylie Tarissa, born in 2004. From 1992 to the early 2000s, Diffie held a charity concert and golf tournament benefiting First Steps, a nonprofit organization for the education of mentally and physically impaired children. His contributions to this organization won him a Humanitarian Award from the Country Radio Broadcasters in 1997. 1 2 3 4 5 6 7 8 9 10 11 Huey, Steve. "Joe Diffie biography". Allmusic. Retrieved 19 July 2010. 1 2 3 4 5 6 7 8 9 10 11 12 13 14 15 Whitburn, Joel (2008). Hot Country Songs 1944 to 2008. Record Research, Inc. pp. 125–126. ISBN 0-89820-177-2. 1 2 3 4 5 6 7 8 9 10 11 12 Stambler, Irwin; Landon, Grelun (2000). Country Music: The Encyclopedia. MacMillan. pp. 133–135. ISBN 9780312264871. ↑ "Diffie Turns Lost Job into New Career". The Victoria Advocate. 13 January 1991. Retrieved 20 July 2010. 1 2 "Opry Member: Joe Diffie". Opry.com. Retrieved 27 July 2010. 1 2 Kingsbury, Paul (1995). The Grand Ole Opry history of country music. Villard Books. p. 238. ISBN 0-679-43556-5. ↑ Netherland, Tom (September 1999). "Joe Diffie gets back to roots". Country Standard Time.com. Retrieved 28 July 2010. ↑ Hurst, Jack (11 November 1990). "A 'Home' run: Joe Diffie trades demos for a hot debut single". The Chicago Tribune. p. 14. Retrieved 29 July 2010. ↑ "RPM Country Tracks". RPM. 23 March 1991. Retrieved 27 July 2010. 1 2 "Joe Diffie: Billboard Albums". Allmusic. Retrieved 29 July 2010. 1 2 3 4 Rasmussen, Tracy (20 August 1999). "Joe Diffie leaving behind laughs for love". Reading Eagle. Retrieved 27 July 2010. 1 2 "RIAA – Gold & Platinum – April 3, 2010: Joe Diffie certified albums". Recording Industry Association of America. Retrieved 29 July 2010. ↑ Come On Come On (CD booklet). Mary Chapin Carpenter. Columbia Records. 1992. 48881. ↑ "Joe Diffie Biography". Oldies.com. Retrieved 19 July 2010. ↑ Mansfield, Brian. "Regular Joe review". Allmusic. Retrieved 20 July 2010. ↑ Rowe, Norman (16 February 1992). "'Regular Joe' Diffie proves success of debut was no fluke". Richmond Times-Dispatch. Retrieved 21 July 2010. ↑ Nash, Alanna (21 February 1992). "Regular Joe review". Entertainment Weekly. Retrieved 21 July 2010. ↑ "Joe Diffie has a new 'Attitude' these days". Fort Worth Star-Telegram. 1 August 1993. Retrieved 21 July 2010. ↑ Nash, Alanna (23 April 1993). "Honky Tonk Attitude review". Entertainment Weekly. Retrieved 21 July 2010. ↑ "Joe Diffie joining Grand Ole Opry". Reading Eagle. 23 November 1993. Retrieved 21 July 2010. ↑ Mansfield, Brian; Thom Jurek. "Tim McGraw review". Allmusic. Retrieved 8 March 2010. ↑ Third Rock from the Sun (cassette insert). Joe Diffie. Epic Records. 1994. 64357. ↑ "Diffie's "Pickup Man" Remade for Applebee's Ad". CMT.com. Retrieved 19 July 2010. ↑ "RPM Country Tracks". RPM. 1 May 1995. Retrieved 27 July 2010. ↑ Bronson, Fred (25 October 1997). "Jackson Lassoes No. 1 with 'Rope'". Billboard: 102. ↑ Owens, Thom. "Third Rock from the Sun review". Allmusic. Retrieved 20 July 2010. ↑ Nash, Alanna (29 July 1994). "Third Rock from the Sun review". Entertainment Weekly. Retrieved 20 July 2010. ↑ Phares, Heather. "Runnin' Wide Open review". Allmusic. Retrieved 21 July 2010. ↑ Erlewine, Stephen Thomas. "Mr. Christmas review". Allmusic. Retrieved 20 July 2010. ↑ Hauenstein, George. "Life's So Funny review". Country Standard Time. Retrieved 20 July 2010. ↑ Owens, Thom. "Life's So Funny review". Allmusic. Retrieved 20 July 2010. ↑ Nash, Alanna (12 January 1996). ""Bigger Than the Beatles" review". Entertainment Weekly. Retrieved 21 July 2010. ↑ Twice Upon a Time (CD booklet). Joe Diffie. Epic Records. 1997. 67693. ↑ I See It Now (cassette). Tracy Lawrence. Atlantic Records. 1994. 82656. ↑ Remz, Jeffrey B. "Twice Upon a Time review". Country Standard Time. Retrieved 20 July 2010. ↑ Owens, Thom. "Twice Upon a Time review". Allmusic. Retrieved 20 July 2010. 1 2 Price, Deborah Evans (3 April 1999). "Epic's Diffie Makes Some Changes for 'Night to Remember'". Billboard: 44–45. ↑ Netherland, Tom. "A Night to Remember review". Country Standard Time. Retrieved 21 July 2010. 1 2 Nash, Alanna (21 May 1999). "A Night to Remember review". Entertainment Weekly. Retrieved 21 July 2010. ↑ Erlewine, Stephen Thomas. "A Night to Remember review". Allmusic. Retrieved 21 July 2010. 1 2 Waddell, Ray (27 October 2001). "Diffie's 'World' View on Monument". Billboard. ↑ Marymont, Mark (19 February 2002). "In Another World review". Country Weekly. Retrieved 21 July 2010. 1 2 Ruhlmann, William. "In Another World review". Allmusic. Retrieved 21 July 2010. ↑ Remz, Jeffrey B. "In Another World review". Country Standard Time. Retrieved 21 July 2010. 1 2 "Joe Diffie Resurfaces With "Tougher Than Nails"". CMT.com. Retrieved 19 July 2010. ↑ Erlewine, Stephen Thomas. "Tougher Than Nails review". Allmusic. Retrieved 21 July 2010. ↑ Weisberger, Jon. "Tougher Than Nails review". Country Standard Time. Retrieved 21 July 2010. ↑ "Success Floods Messina Via "My Give a Damn's Busted"". Broadcast Music Incorporated. Retrieved 19 July 2010. 1 2 Carlson, Carrie (25 September 2006). "Joe Diffie ready to entertain at Brown County Fair". The Ledger Independent. Retrieved 21 July 2010. ↑ "Lonestar, Daniels and Morgan Perform for Wounded Soldier". CMT.com. 16 July 2007. Retrieved 21 July 2010. ↑ "Joe Diffie Tackles Live Album". gactv.com. Retrieved 8 August 2008. ↑ "Joe Diffie signs with Rounder". Country Standard Time. 28 September 2008. Retrieved 20 July 2010. ↑ Sudhalter, Michael. "The Ultimate Collection review". Country Standard Time. Retrieved 21 July 2010. ↑ "Diffie returns with bluegrass CD in August". Country Standard Time. 18 May 2010. Retrieved 20 July 2010. 1 2 j. poet. "Homecoming review". Allmusic. Retrieved 29 October 2010. ↑ Nicholson, Jessica (4 November 2012). "Joe Diffie 'Stunned' by Shoutouts in Jason Aldean's '1994′". Taste of Country. Retrieved 2 March 2013. ↑ Nash, Alanna (17 December 1990). "Too Cold at Home/A Thousand Winding Roads review". Entertainment Weekly. Retrieved 20 July 2010. 1 2 Sanz, Cynthia (26 April 1993). "The Difference in Diffie". People. 39 (16). ↑ Hughes, Donna (16 July 2010). "Joe Diffie's Kids Try Out for 'American Idol'". The Boot. Retrieved 27 July 2010. ↑ Brown, Ben (14 October 1993). "Allison's widow dating". USA Today. p. 2C. Retrieved 27 July 2010. ↑ "Briefly…". USA Today. 13 January 1994. Retrieved 27 July 2010. ↑ "Joe Diffie Ties the Knot". CMT.com. Retrieved 19 July 2010. ↑ Sculley, Alan (11 May 2002). "Just being himself makes a difference for Joe Diffie". Morning Call. Retrieved 21 July 2010. ↑ McIntosh, Dan (June 2004). "Joe Diffie is tougher than nails (page 1)". Country Standard Time. Retrieved 21 July 2010. ↑ "Joe Diffie Holds 10th Annual First Steps Benefit". Yahoo! Music. 12 February 2002. Retrieved 27 July 2010. ↑ "World's Best Vie for Grammy Awards". Deseret News. 9 January 1993. Retrieved 20 July 2010. ↑ "Joe Diffie: Grammy Awards". Allmusic. Retrieved 20 July 2010.